24/7 support desk (including contacting via Skype and online chat). Subscription status will be updated straight after the administration receives funds. VIP Plus members are provided with 24/7 Skype support. The fastest arb scanner is the best scanner. Speaking of the operation speed, OddStorm undoubtfully holds the leadership. The service provides tools for analyzing a wide range of abs — both pre-match and live ones. Processing such a bulk of information, it flicks through dozens of bookmakers within seconds, and therefore this software totally deserves the top place in our rating. Let’s figure out why. 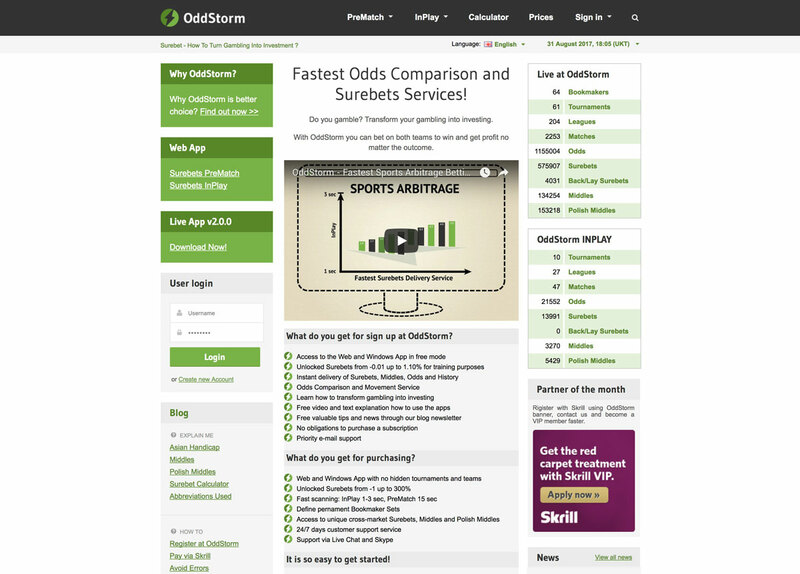 Created in 2006, OddStorm has made it to get numerous long-standing fans, being a premium-segment service offering convenient interface and rich functionality. The service spans more than 60 bookmaking offices, and the quality of operation justifies subscription plans absolutely. Arb bet amount estimation (via an online calculator). It should be noted that OddStorm is the only scanner processing Polish Middles. Though the latter are not purely win-win ones, numerous gamblers are interested in them. Being “arbish”, they are perceived as ordinary bets by most bookmakers. The core of the strategy is leveraging as many outcomes as possible. With that, the first bet is Asian Handicap, bisected during calculation; the second bet is made for the opposite outcome. Usually, Polish Middles emerge in soccer, and lose in case of a draw. Scanner is notable for its speed: processing time amounts to 1-3 seconds for live arbs and 15 seconds for prematch ones. It becomes even more crucial considering the speed is the most significant factor in arbitrage betting — particularly in searching for max-profit surebets. However, language switching doesn’t always work properly. But the 24/7 support desk operates in several languages. The arbs themselves are displayed in the central window block, updated mostly every second. Having found a worthwhile arb, one just needs to click on a betting shop’s name and then estimate a bet amount by means of the built-in calculator. The entire process will take just a few seconds, while “time is money” cannot be more suitable anywhere but here. 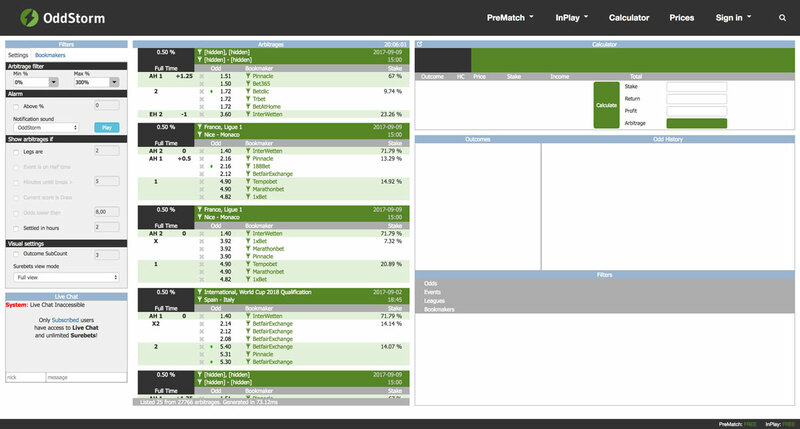 Free access to surebets with profitability of up to 1% before sign-up and up to 1.5% after sign-up. High surebet search and analysis speed. Rich choice of industry-leading betting offices. Searching for up to 300%-profitability surebets on subscription. Sound notification at detecting a fitting surebet. 24/7 email and online support desk. Subscription plans are more expensive than the market average. Bets cannot be filtered by sports. Among users, Polish Middle backers pay most attention to OddStorm, as this is the only scanner capable of finding them. Speaking of service quality, speed and number of arbs detected, the scanner can barely be criticized. Based on customer feedbacks, the only pinch point is the subscription price. OddStorm is a grave and highly-functional product offering numerous opportunities for an experienced gambler. It can be beyond budgets of novices, though it is not reasonable to invest much into a subscription when learning basics. Instead, an any-experience gambler can easily grasp ins and outs of arbitrage by virtue of a free version of the scanner. Rich functionality, high-grade support, analysis speed and volume are the factors that bring OddStorm to the top 5 scanners of our rating. Just trying to grasp the betting basics. Haven’t found my gambling strategy yet and decided to try arbs and talk about it on the forum. OddStorm reviews instilled my confidence, but I found out that a desire was not enough for success — I had to hone surebetting skills. First, I swallowed that bait of 300-percent profitability surebets. Paid more than 60 euros but never expected that most valuable arbs could appear and then vanish that fast! So, it all made me tick and I lost lots of good arbs. It’s great. I liked almost instant update of Live, I would say, it took 1-2 seconds. You manage to play. Never once did I miss. It is convenient to make subscription payments. There is a free trial version, but do not look to more than 1% in it. It is possible to filter the bookmakers depending on your personal preferences right away - not to register at all bookmakers in a row at once. It seems the best I've ever tried. OddStorm works not only with arbs, but also with middles. In particular, the Polish Middles are the best here. Then, the built-in calculator allows users to assess the financial viability in a short period of time. If you play for the high stakes, feel free to choose OddStorm. The 5/5 rating is quite well deserved.